2) Part-time undergraduate student researchers required to assist with study on status of invasive species in Singapore. The work is mainly desktop data-mining. Good computer skills are needed. Some background and interest in tropical marine ecology is essential. Feb – June 2012. 3) Short term casual work, 3 months full time, from March – June 2012. A research assistant is required to assist with data analyses for a project on marine coatings performance. Suitable person should have a marine biology degree, and comfortable working with Adobe Photoshop and Excel spreadsheets. Job location is St John’s Island. Hons student Ouyang Xiuling is an NUS SPARKZ 2012 finalist! Sparkz is “an annual talent show that provides a platform for all NUS students to showcase their talents”. This year, the line up of 12 finalists includes biodiversity honours student Ouyang Xiuling. When she’s not out in the forest dealing with her experiments, she has been singing! On 28 Jan 2012, they battle it out at the main event at the NUS Shaw Foundation Alumni House! It’s a sold-out event, but there should be news on their facebook page. Congratulations Xiuling! This took lots of courage; all the best for the finale and no stage fright! *fingers crossed* Remember, just look at the audience and think of your specimens! The Centre for Tropical Forest Science, NIE/NTU has undergraduate student assistant opportunities. It’s a good way t get acquainted with the forest. Wanted to learn about tropical biodiversity? Astound your friends with your awesome knowledge of forest trees? Know what foresters refer to when they say “SHORCU”, “SANTAP”, or “STREEL”? Learn field skills that can come in useful during the course of your studies? And better yet, to be paid for experiencing all this? Contact Ngo Kang Min (ngokangmin@gmail.com) for details. CDTL’s new e-learning module on Oral Presentation Skills for students is accessible at http://emodule.nus.edu.sg/presentation-skills/part1/. “This pilot e-module, “Preparing for Successful Oral Presentations”, is the first of a 4-part series, developed by CDTL in collaboration with CELC and is aimed at providing a self-assessed e-learning module for students to learn useful techniques and strategies in Oral Presentations. Summary notes and resources such as presentation slides, answers to self-tests and links to other related oral presentation skills videos. Will include this in weblinks for LSM2251 Ecology and the Environment and LSM1303 Animal Behaviour, both of which feature a student symposia. Yesterday morning, I delivered the introductory lecture to this academic year’s LSM1303 Animal Behaviour module for non-biology students. I explained to students that the original course for zoology students was initiated in the 90’s by a fresh-off-the-boat Navjot Sodhi. He applied himself energetically to his teaching when he came and initiated the Animal Behaviour course for biology students. When we recce-d Tioman for the honours year field course (with Tommy Tan, obviously), I discussed with him many issues about NUS. Amongst the things I shared was how undergrads were unfamiliar about the peer review process – to my surprise when he got back, he initiated a review paper assignment with two peer reviews by fellow undergrads using pen-names and corrections by authors – and he marked all of it! And he did this for several years. I remember sorting the papers with Adrian Elangovan and Marjorie Castelletta and we were all impressed by the amount of marking he was volunteering to do. His desk was littered then as it was at the end, and teaching contributed to a fair share of the mess. So he was energetic about teaching when he first came, as he would be come to be known with research later. He certainly invested more than a mild interest in this professorial duty. And he didn’t want to be pinned down by the rigidity of a rubric during assessment, but wanted to a flexible system which allowed us to be responsive to interesting ideas or perspectives which students might unearth. In 1998, I learnt from Andrew Tay over at the Nature Society (Singapore) that African carnivore filmmakers Derek and Beverly Joubert would be at the National Library (now the Stamford Road hole in the wall) to talk about their work and unveil one of their National Geographic books. 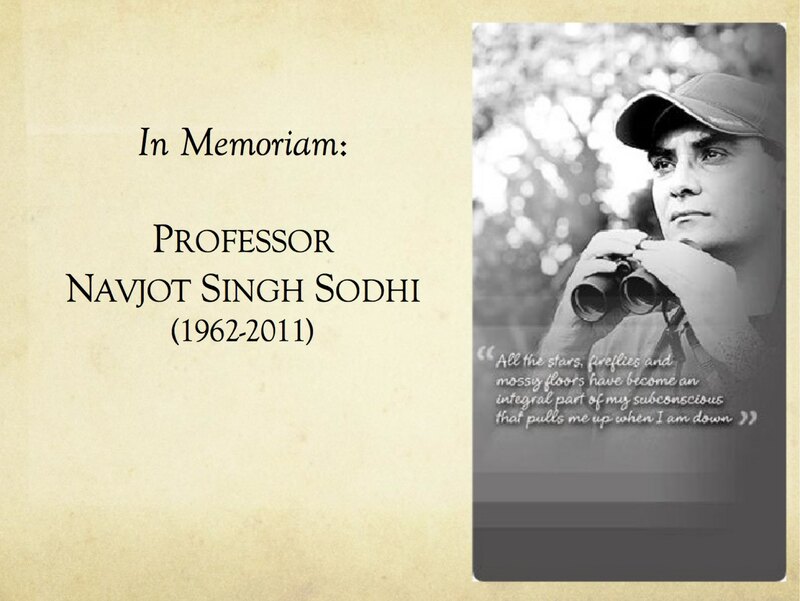 Fascinated by their film Lions and Hyaenas, I asked Sodhi if I could hijack his forthcoming lecture. He readily agreed to throw out the lecture and we screened the video and had a short discussion about the film with students. At the library later, I realised a few students had gone down to listen to the Joubert’s, including Zeehan. The Joubert’s were thrilled we had used their film (even though it was a musty video taped off television by Kelvin Lim of RMBR) for they wanted the message of understanding Africa carnivores to get out. This had been possible because Sodhi was enthusiastic and opportunistic about learning opportunities. He understood that there were many ways to learn and contribute. I went over the Raffles Museum of Biodiversity Research full-time in 1999 and regretfully stopped TA-ing the course. In 2004, however, some museum staff were roped in by the faculty to teach and Sodhi laid claim to me to co-teach LSM1303. I observed a couple of his lectures and as when I began, tried to complement Sodhi’s style somewhat. I slowly edged up the content and grappled with the module outcomes – how much should we expose students to? What message should they leave with? By this time, Navjot was, as Zeehan would later say, a superstar conservationist. But he knew we needed more than research alone, that we needed many and all sorts of hands on deck to cope with the sixth extinction. In one of our corridor discussions, I remember, and this plays like a video in my mind, he shook his head slightly as if to dust off the many elements of the discussion and mumbled, “I just wanna teach them some empathy”. I was struck by how emotive and frank that was. About a year after that, he said he was going to leave the course to me. I had known this was coming for he had wanted to leave earlier, even though I settled all the admin, which he abhorred mightily. However, he needed time to cope with his voluminous output of research papers and book chapters and so it was time. He was amused when I expressed regret that young students would not get exposure to his strange manner and outlook! But he knew when to let go. So first Matthew Lim and now Zeehan Jaafar co-teach the module with me. Thereafter, I’d update Navjot when I saw him in the corridor or car park every now and then about what I was doing with the course. During his last lecture, for example, he exposed students to the scientific approach with which he had addressed the crow problem. I had retained that but amplified it to an urban animal-human conflict lecture with chapter additions about the common palm civet, long-tailed macaque, stray cats and wild pigs, partly from our research projects. Meanwhile, the symposia now demanded of students a research question, had them study wild, not captive animals, lecture notes they were given included some mention of journal sources and I made them blog. 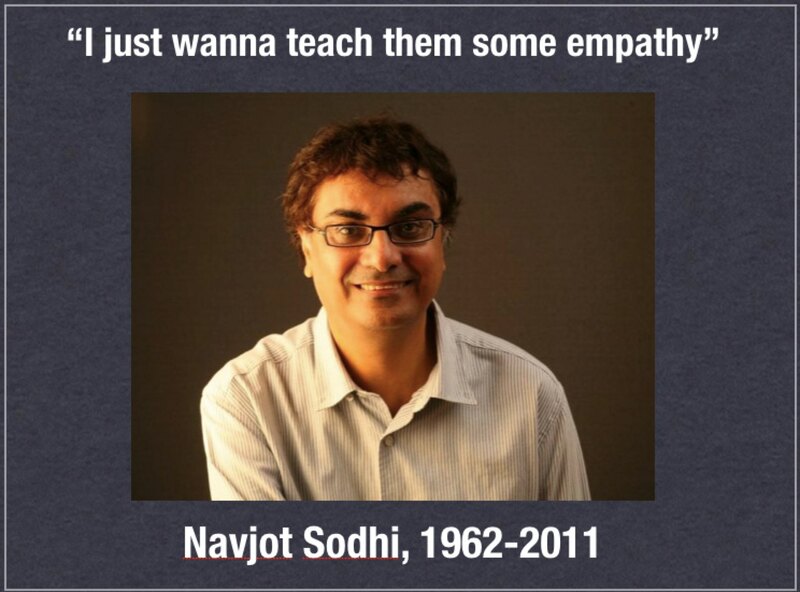 Navjot was supportive of the changes and appreciative that I said his statement about empathy was central to the module objectives still – to teach students some empathy through knowledge and appreciation. I also shared about how I’d tell students about him, that quirky professor who’d make them chuckle – heck, I even kept some of his awful blue slide backgrounds as a hat tip and tell students it was his gawdy colour sense, not mine. Every year I’d hover over the delete key and decide against removing that characteristic blue. It was what you said which counted anyway. So yesterday, some 200 students learned we are not soullessly teaching animal behaviour. Yes, we are certainly curious and fascinated by the subject, and believe in testing, repeatability, mensuration and the rest of it. But we also care about animals and the planet and believe that all our students can help do something about it – and probably in ways we are unable to. RIP Navjot, you are always remembered. Maiden lectures today by Mingko and Dan in ecology and coastal management! Today was a lovely day! While I learned to sip (not swallow) coffee, maiden lectures were being delivered by my bright and chirpy friends, Dan Friess in GE4207 Coastal Management over at Geography (his soul still belongs to us) and Mary Rose Posa (aka Mingko) with the LSM2251 Ecology and the Environment class! Honours student and mangrove disciple Rick Leong was at his shifu’s lecture and facebook-ed us some highlights. Back in Science, Mingko worked the room at the first Ecology lecture this semester. Thanks to Erica Sena Neves, we have some witness of her first foray in awakening young minds to the fundamentals of ecology. Roaming the room with the wireless microphone! We’re all excited to have Dan and Mingko out there, fighting the good fight. All the best in the semester ahead and congrats to the students to having two more enthusiastic educators in their stable! Dan the man is in geography now! Dan Friess’ life as a post-doc in the department is over! He joined the Geography department as an Assistant Professor from the 1st of January 2012 and will be teaching a 4000 module in Coastal Management next semester. He promises to have lots about mangroves in there. Of course, nothing else has changed, and he still has to save Mandai mangrove and mudflat from disappearing! You can follow Dan on twitter. Don't let the nutrients fly away! Sat 8th Dec 2018: Sungei Buloh Anniversary Walk - registration open for the 25th celebration! Announcing the 4th Biodiversity of Singapore Symposium, Sat 01 Aug 2015 – 24 five-minute presentations and 30 posters! Wed 27 May 2015 @ NUS U Town ­ "The Future of Marine Science in Singapore"
20 Apr (Sat): What's in my mangroves?